Anuja Chandramouli: The Hopeless Blogger! Sophie and the Sibyl is set in Berlin, 1872 and is a charming reimagining of the twilight years of literary powerhouse, George Eliot who unfortunately has come to be viewed with a touch of annoyance by later generations who were in all likelihood force fed Silas Marner, in the classroom thanks to an exacting literary curriculum. In Patricia Duncker’s tale, the celebrity author is unlikely to be loved although her magnetic pull will be felt. At the outset, the lady of letters has fled to Germany to escape the scandal when she made the choice to live with a married man. Meanwhile, her German publisher, Wolfgang Duncker, orders his handsome if feckless, younger brother, Max to visit the great lady in Homburg and acquire the rights to Middlemarch. On the personal front, Max is to marry the young Countess Sophie Von Hahn who is also at the spa town. Wolfgang hopes that between them, Sophie and the Sibyl (as Max refers to Eliot) will succeed in giving his brother fresh purpose and lure him away from the brothels and gambling tables that he has taken to frequenting. And thus the three main characters take their positions for the “sexual triangle of Middlemarch” and the reader is led on a merry dance at the urging of a nameless narrator. Duncker has a penchant for mixing fact and fiction in “outrageous ways” and her wicked ingenuity is delightful. Max is initially disappointed on meeting the Sibyl because not only is she old but ugly as well which is why he is unprepared for the powerful attraction he comes to feel for her. Sophie, who originally worships at the altar of the Sibyl, comes to loathe the lady as “La belle dame sans merci” who has her man in thrall. 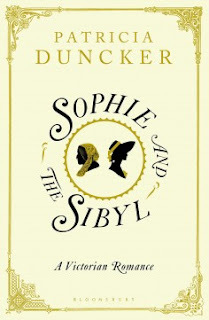 In exploring the dynamics of Max’s relationship with the two women who come to define his life, as well as the narrative asides that detour into the rich landscape of historical fact and classical art, music and literature, Duncker examines the bare bones of the creative processes that birth great fiction. Drawing on her acute observations from life, and using the raw power of words, the Sibyl exorcises her personal demons by lashing out at those blessed with things she does not possess, painting them as vain and vapid creatures for whom she believes doom to be just comeuppance, denying them the happiness she herself has always felt entitled to. The Sibyl leads a brazenly unconventional life with courage and grace, though in her books she exalts conventionality as morality and uses her formidable tools to punish characters who dare to stray. Later, she is soundly berated by a furious Sophie who pulls her up for living one life and believing in another while urging her susceptible readers to settle for self – sacrifice and subservience. Neither woman will give any quarter though and are both determined to wrest whatever they will from life, thereby sounding the clarion call for female empowerment in this intellectually enriching saga. This review originally appeared in the New Indian Express and you can access it here.